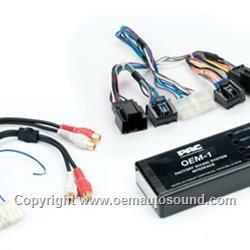 RCA audio output for adding aftermarket amplification. Please read before installing interface. 1. For most vehicles, the warning chimes play through the front left speaker. This warning chime will be present on the left front RCA output of AOEM-GM1416 interface and will be amplified through the aftermarket amplifier. 2. The factory head unit is a dual audio source unit. It can play CD audio on the front speakers and AM/FM audio on the rear headphone jacks or vise verse. Turning on rear entertainment console controls will make the rear outputs of the AOEM-GM1416 interface play the second audio source. There is no way to get around the factory warning chimes and rear headphone second audio source. Please read vehicle owner’s manual to set the warning chimes to lower volume.